There are two ways to change the results of an election by fraud. Either the ballots are changed, or the tallies of ballots are changed. That's it. If ballots are not produced or removed fraudulently or the numbers reported in the final tally are not the numbers of actual counted ballots, then there was no election fraud. The problem with both scenarios is that Iran is widely reported to be in the midst of a factional power dispute with resourceful and influential groups on both sides. Creating 10 million ballots would mean weeks of full-time false ballot production by hundreds of people. Creating and distributing a number of ballots that could influence the election would involve too many people to be kept as a secret from some of the most powerful organizations in the country that oppose the declared victor in the election. In the early aftermath of the election it was widely and falsely reported, including by US-aligned groups in Iran, that, contrary to Iran's normal practice, ballots were removed from local polling places and counted in secrecy. Now that better information is available, there is no indication that this happened. Instead tens of thousands of election observers from every campaign were present in almost all local polling places as the votes were counted. There are tens of thousands of election officials who transmitted results to Tehran for their districts. For Mousavi to have won the local vote counts while Ahmadinejad won the centrally produced tally would require thousands of officials to know that they reported Mousavi victories while the Interior Ministry reported Ahmadinejad victories in their polling places. It is not plausible that out of these thousands of officials, every one has remained silent as at least dozens of Iranians died. A massive vote producing operation would have been required to produce a result-altering amount of votes. Also a massive conspiracy of tens of thousands of local election officials, each with decisive information that bears on a current national factional power-struggle, would be required for enough votes to be changed by fraud after they were counted. Either of these massive frauds would have left traces that would have been detected, if not by foreigners or by college students, at least by the very powerful and resourceful faction in Iranian politics that openly and vehemently opposes Ahmadinejad. Evidence presented for election fraud really should be embarrassing to those that purvey it at this point. There is (paraphrasing) "these result are different from what I expected" that Juan Cole is still presenting as authoritative proof of fraud. Two weeks after the election "evidence" of that form is not worthy of a response. It wasn't worthy two days after the election. Then there is the argument that Iran's response to the protests somehow is evidence that the election was fraudulent. This is a mind-boggling argument. Hundreds of thousands, maybe millions of people took to the streets on the basis of rumors, at least with foreign support, if not foreign direction, with the stated intention of removing the government from power. The argument is something like governments only put demonstrations of this type down after false elections. That argument is also ridiculous on its face. There is the argument that unless there is fraud it is not possible to convince large amounts of people to buy into an atmosphere of rumor and distrust. People seriously make that argument. Once again, it strikes me as an argument that could only be presented with a straight face by someone whose perception is distorted by some emotional bias. Elections are intense times and if a losing candidate says publicly that he does not accept election results, the candidate's supporters will support him. That is what supporters do. Anywhere in the world. Fraud or no fraud. 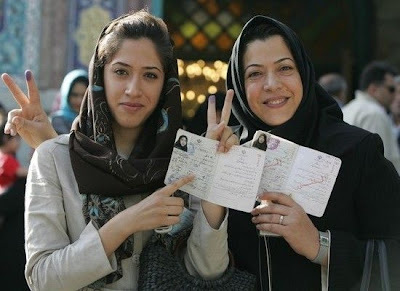 But for both of the two ways result-changing fraud could have happened in Iran, fabricated ballots or Iran's Interior Ministry ignoring the results transmitted by the localities, there is enough information available now to render each implausible. Ahmadinejad's victory was determined by his getting more votes from Iranians, not by some mysterious and still-unknown plot to steal the election. For a weblog named "Mideast Reality" you sure do present little of the latter (reality). No one ever said that TEN MILLION votes were stolen. For all we know, it could have been only 4 or 5 or even less. We don't KNOW the real results, so we don't KNOW how many votes were rigged. Just today, Hassan Babadi, who heads the "party" closest to Ahmaidnejad (Abadgaran) came out and said he's really concerned by recent events and "they knew"! from before the election that this contest would go to a second round (meaning that neither Mousavi or A.N. would win over 50%) and in the runoff, they also "knew" that A.N. would win and that win would have been much more "dignified". And ALL THREE CANDIDATES except the incumbent have accused both the interior ministry and the Guardian Council of fraud, not only Mousavi. Here and Here you can find a detailed account of the allegations. I've translated some of it here, but that's not even 1/10. I personally know Mousavi and Karoubi monitors in Tehran. Between 7 and 9 p.m. they were KICKED out of the voting centers, and both candidates' headquarters were ransacked, their computers, papers and everything else in their offices were CONFISCATED, their phones have since been out of order, and some of those monitors (including two I know) are now in PRISON since that Friday. We disagree less than it would seem from your tone. Ahmadinejad had over 10 million votes more than necessary to avoid a run-off. For all we know, it could have been only 4 million votes stolen, according to you. For all we know, it could have been no votes stolen. For all we know, we should not be calling this a rigged election. We have not seen any tangible indication of any stolen votes. However, if for some reason a massive fraud was executed that left no trace but only stole 9 million votes - and there is no reason to believe that happened, just as there is no reason to believe over 10 million votes were stolen - then the election was not determined by that massive but undetectable fraud. The reason nobody says 10 million votes were stolen is that it is not a plausible number. There is no way that number of votes could be stolen in a country with a powerful faction of power in vehement opposition to the supposed vote-stealer without there being tangible signs of fraud. 10 million votes would require the knowledge or involvement of hundreds or thousands of co-conspirators. All breaking the law, all knowing the act of stealing these votes goes against a core moral belief in their society but none making themselves known to the powerful people that they know are in opposition to the fraud. But if the US in 1984 had the lack of polling data present in Iran in 2009, Ronald Reagan's victory over Walter Mondale would have been a shock. The numbers would not add up and would be "clear" proof of a fraud. Given internal and external support, Mondale might have fought to overturn the results and millions of his supporters would have been angry, at least at first. But a fraud of enough scale to have been decisive would have left traces and there were none. Mondale and his supporters easily could have produced rumors and isolated unsubstantiated stories of misbehavior by the Reagan forces, but no indication or explanation of how Reagan stole enough votes to fraudulently win the election without a trace. Because that election had not been decided by fraud, regardless of the shock. Until we get tangible evidence of massive fraud, which by now is almost certainly not forthcoming, the most reasonable proposition remains that Ahmadinejad had greater support than you expected and, as the election results show, is more popular than your candidate. That sentence makes no sense whatsoever. From polling that took place INSIDE Iran, the expected result was that Mousavi and Ahmadinejad were fighting neck and neck. So those 10 million votes could have been split any way between the four candidates. It wasn't just two people running. When was the last time you were in Iran? And how much time have you spent reading PERSIAN accounts of what happened? There are endless reasons why we believe the results WERE rigged, JEYSUS, I just told you monitors WERE ARRESTED the night of the election. Here you can listen to Ahmadinejad's minister talk about HOW there could be fraud by "placing unfolded sheets inside the boxes prior to voting and thus, any ballots that aren't folded are automatically assumed to be fraudelent. There's simply no way you can place your ballot inside the boxes without folding it twice"
the ballots that the guardian council counted were ALL crisp, clean sheets, no folds! We have accounts of how the monitors were harassed and abused and kicked out all over the country. You can go on believing what you do, it's really irrelevant. But taking what the media feeds you and just turning 180 degrees is STILL LETTING THE MEDIA FEED YOU. Don't get angry at me. I'm irrelevant, just like you. I don't think you really believe that every single ballot the Guardian Council counted was crisp and unfolded and therefore could not have been made on election day. If you do, you and a few hard-core Mousavi supporters feel this way. It is just not a reasonable interpretation of reality. You like Mousavi. I like him too. You wanted Mousavi to win. I wanted him to win too. It didn't happen. Ahmadinejad avoided a run-off by 200 votes per ballot box in Iran. You can't come up with a plausible way for that to be done fraudulently without hundreds or thousands of people knowing about it all over the country. A margin like Ahmadinejad's of over 10 million votes means that for fraud to have been decisive, 10 million votes had to be added to Ahmadinejad, 10 million subtracted from his opponents or some combination. Between additions for Ahmadinejad and subtractions for his opponents, it still has to come to over 200 votes per ballot box. Even if every Mousavi election monitor had been arrested, and that did not happen, it still would be impossible to keep the addition or subtraction of 200 votes per ballots box, everywhere in the country secret because Mousavi's monitors are not the only Iranians who believe votes should be counted. You've gotten yourself caught in a bubble. The people around you have mutually suspended disbelief and are pushing each other further and further from reality into a world where the only truth is that Mousavi won. If you must believe Mousavi has more popular support than Ahmadinejad, then everybody else in Iran is part of this huge conspiracy to thwart the good. Any ballot box in the country not certified by a Mousavi monitor must have had 200 or more pre-stuffed ballots. If one Mousavi monitor was arrested, every single Mousavi monitor in the country was arrested because only they could have stood up to this overwhelming fraud. The thing is that if I ask you to explain how Ahmadinejad's over 10 million vote margin could have been accomplished by fraud if Mousavi got more actual votes, (even just in theory, as a thought experiment) you won't be able to, but the fact that you aren't able to doesn't alter your faith, but the question itself makes you angrier. This is your world. I feel sorry for you more than anything else. Decisions based on your world-view are going to be predictably but horribly ineffective in part because you and those in your bubble are going to consistently expect things to happen that are not going to happen. Fact is that we don't know what happened in the election. Even back when we ruled Iran through the Shah and wanted him removed because he wanted to raise the price of his oil, the CIA-Khomeini collaboration of 1979 that the students pieced together strip by strip from the US Embassy shreader and used to blackmail Khomeini into acts of radicalsim that are not his, only remind us that the trouble with our high-fat fed CIA is a bureacracy that doesn't learn how bad is playing with religion in politics from its Vietnam experience with Diem and the Buddhists. Now WE-- THE BLIND-- are trying to see with our confabulating brains THE TRUTH. Meanwhile, one thing is obvious, the Chinese think that as our bankers they should have more say on how we spend our unbacked money intervening in the Muslim World. They also think that time has come for us-- given how stupid our leaders since the end of the Cold War-- to mind our own business, not interfere in Iran for Zionist campaign money and, above all, stand up when the Chinese chiefs walk into the room. What can we Americans expect after so many shoping orgasms in Wal-mart. What exactly does reform mean for Iran? So March 14 won big. What does that mean? What's in it for Gamal?